Giant Hogweed plants grow higher than 15 feet tall. They look very dramatic and beautiful when they bloom in the spring. Unfortunately, they can also cause severe skin irritation, blistering, permanent scarring, and even blindness. Skin problems resulting from exposure to the plant’s sap can last for years. The skin’s reaction to exposure feels like a burn from a hot stove. Photos by Deb Collins and Olivier Bacquet. Giant hogweed is an invasive plant species related to carrots and parsnips. It originated in the Caucasus Mountains of central Asia, and was brought to New York in the early 1900s as an ornamental garden plant. 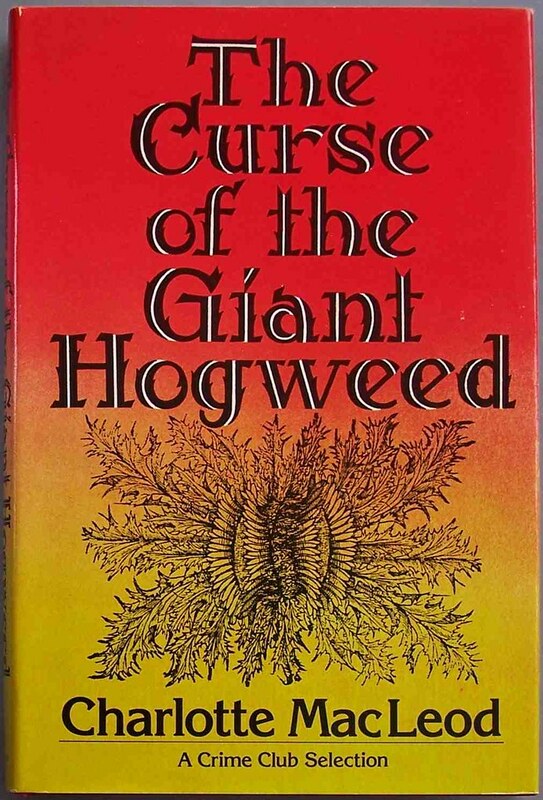 Because the Giant Hogweed has few natural enemies on this continent, it has spread beyond New York state, to infest New England, the mid-Atlantic region, and the Northwest. Additional specimens have been found in Michigan, Pennsylvania, Wisconsin, and Illinois. Giant Hogweed plants grow alongside rivers, in fields, forests, yards, and roadsides. They prefer areas with lots of sunlight, but can live in partial shade. Giant Hogweed is federally listed as a noxious weed. If you see any or have one on your property, notify the authorities and don’t attempt to remove it yourself. Some people, aware of its toxicity, have allowed it to grow on their property because it’s an interesting plant to look at. The problem with this is that it is still a hazard to public safety even when fenced off. Each plant can produce 50,000 seeds, which may then be carried by animals or on the soles of shoes and spread to other areas, where the plants will grow and proliferate. 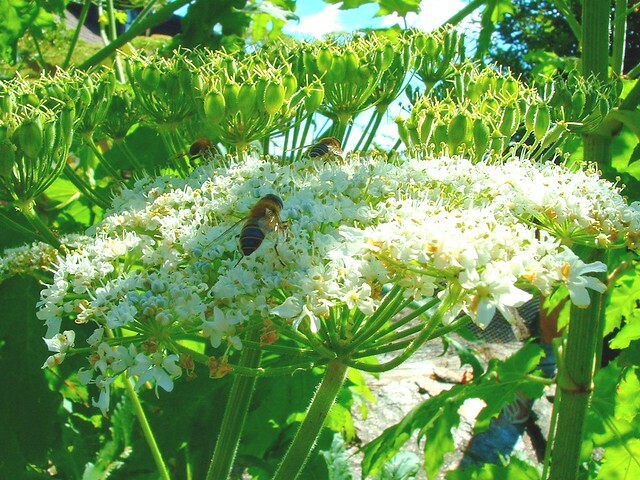 Giant Hogweed is a very hardy plant, and seeds are viable for 7 years. Although the adult plants grow to over 15 feet in height, remember that younger plants will be much smaller. They can be identified by their deeply lobed leaves. The edges of the leaves are serrated and look very pointy/spiky. They have huge umbrella shaped flower clusters, 2.5 feet across near their top. The stems are green with purple splotches and have coarse white hairs. 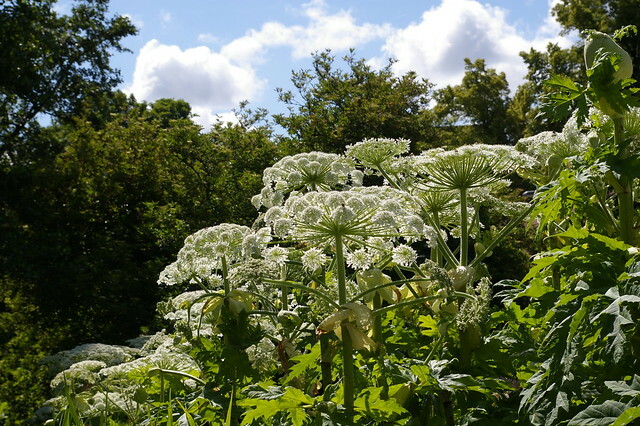 More information on giant hogweed identification can be found here. Contact with the poisonous sap occurs when the stems or leaves are broken and/or when the skin brushes against the hairs on the stem. Reaction to the sap (warning: graphic photos) can happen as soon as 15 minutes after contact, when the sap is exposed to sunlight in combination with moisture (e.g. sweat). The sap destroys the skin’s resistance to sunburn. Even brief exposure to sunlight will induce sunburn. Depending on the amount of sap exposure, skin reaction can be very severe and painful. The affected area’s sensitivity to light may last for years. When exposed to the sap, immediately wash the area with soap and cold water and protect the area from sunlight exposure for at least 48 hours. Call a doctor. Don’t touch your eyes–remember, the sap can also cause blindness. Giant Hogweed is an invasive plant that threatens human welfare, displaces native plant species, and is very difficult to eradicate. Report any possible sightings. 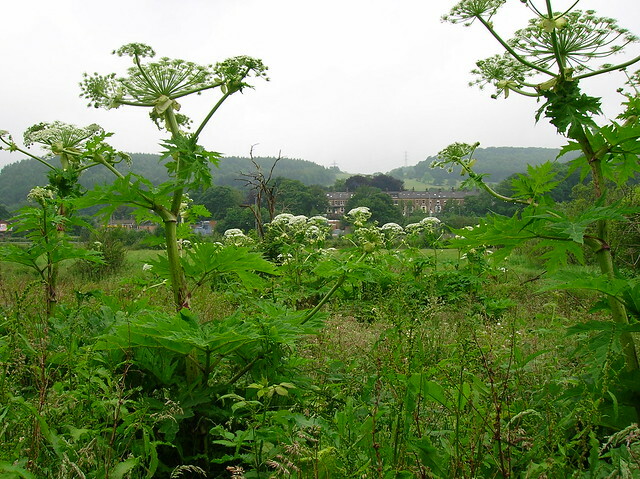 Some states have a phone hotline and/or a contact email address for reporting Giant Hogweed. By notifying the authorities, you will not only be acting to protect the environment, but public safety as well.